I'm aiming to bring a couple of pumpkin pies to the extended family Thanksgiving dinner this weekend (ask me next week if they actually got made...). If your family is like mine, then pie is the only item I can count on my kids eating at Thanksgiving. So, I like to make mine as healthy as possible, y'know, relatively speaking. Mix remaining ingredients together. (Adjust the sugar and spices, if you like, according to your family's taste.) Pour into crust. Bake at 350 C for appx 45 min, or until centre of pie is set and knife inserted into middle comes out clean. If you like extra spice, try mixing in some chopped candied ginger or some ginger jam with the filling before baking. Yum! 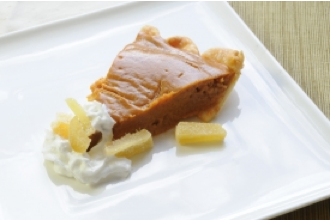 Do you have a healthy pie recipe you love? Share it with us!